One might think that fashion is immune from having to think about what goes on outside its own world—that the only time fashion and politics coincide is when somebody talks about Hillary Clinton and her pantsuits, but that is not the case. Activism has been very much in Vogue, with designers looking towards social and political issues for inspiration. Maybe designers have finally realized that getting dressed every day is the one art form that everyone is forced to participate in; well, almost everyone. So why not say something with the clothes that you are already putting on? This past year it’s been all about women, their rights, and who gets to decide what they are. It seems that the world has been weighing in on what exactly feminism is and bringing this idea to a whole new generation of Betty Friedans. 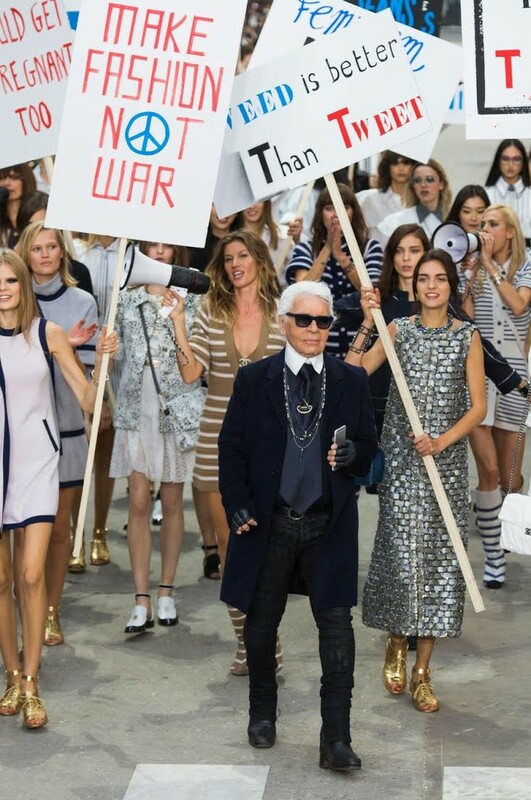 So it’s only fitting that at this past spring/summer 2015 fashion week, Karl Lagerfeld, head designer and creative director of Chanel, held a feminist protest reminiscent of the 1960s women’s liberation movement. Lagerfeld is known for his runway shows—just think of the Chanel Supermarket catwalk of autumn 2013. This year was no different: The runway was complete with signs that read “History is Her Story,” “Ladies First,” “Boys Should Get Pregnant Too,” and even gave a nod to Emma Watson’s now iconic U.N. speech with “He for She.” This was no shabby get-together. Cara Delevingne, armed with a quilted megaphone, led a pack of “it” models, such as Gisele Bundchen, Georgia May Jagger and even Kendall Jenner around the Boulevard Chanel. This wasn’t the first time this had been done, nor will it be the last. A year ago, when climate change and global warming were the “it” words, Vivienne Westwood, a designer who made a name for herself in the '70s modern punk movement, produced a whole collection featuring anti-fracking illustrations and slogans. Unlike Chanel, Vivienne Westwood did not just stop at the clothes. Instead she participated in anti-fracking protests, even leading one in Manchester, and she continues to be a voice for our planet. This brings up the question of whether or not designers are looking to social and political issues just to stay relevant, or if they’re doing it because they actually care. I guess an even more important question is: Will the exposure they are giving the issues be enough to make a difference? Maybe walking around a fake boulevard in the Grand Palais to Whitney Houston’s “I’m Every Woman” isn’t the most revolutionary form of protest—but it has to be the most fashionable.